This no-nonsense and affordable instrument ticks all suitable boxes to qualify as a real rock guitar. Great rock tones. Simple design. Excellent playability. Range of finishes. Nothing that's not purely cosmetic. Levinson LHN-4 humbuckers are ready to rock. Our DD-3 is swathed in a gold finish. Think AC/DC if Angus played through an overdrive pedal. The Durango name has been found on a variety of disparate Blade guitars over the years. Not least of these is the original Durango Deluxe. That guitar was built in conjunction with Eggle Guitars and, although a double-cut, it resembled a cross between and Music Man Axis, Telecaster Thinline and an Eggle New York. "There's enough tonal depth on tap in spite of the thinner body design." "It was one of those, 'designed on a napkin' things," Blade main man Gary Levinson told us at the time. "I got back to the workshop, started playing around with it, came up with the modified Thinline-type of pickguard, and the Durango was born." Subsequent incarnations such as the Durango T Classic and T were single-cut designs, with either an extra central single-coil or a pair of P-90-style pickups on board. More fundamentally, the guitars had a Fender scale length of 648mm (25.5-inches). The Durango didn't evolve into something akin to what we have here until the mid-2000s, with the introduction of the Durango Deluxe DD-2 and DD-1. Both leant more enthusiastically towards the Gibson school, not only due to the reduced 629mm (24.75-inch) scale length, but also the dual full-sized humbuckers. So what of this new model? "The Durango DD-3 and DD-4 have thinner bodies [than a Les Paul], giving a distinct tone that lies 'between' a Les Paul and an SG-type guitar," says Blade's Christian Hatstatt. "They're made with the rock player in mind - the DD-3 is a bit hotter, definitely a rock axe." The DD-3 also lacks a maple cap. Our version is swathed in a gold finish that comes close to matching the classic Gibson hue for depth and opulence: just a number of small blemishes blot the copybook. Other colour options available here include slightly more contemporary finishes such as tungsten burst and open-pore black. 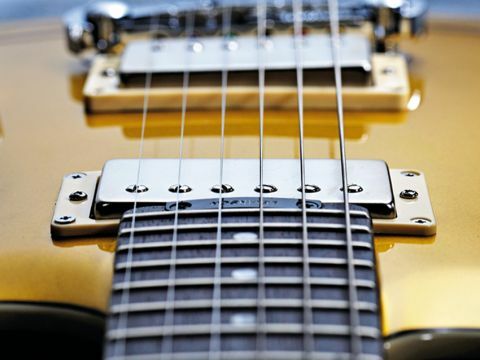 The pickups are Levinson's LHN-4 humbuckers, which give a higher output than the more mellow LHN-5s, and the configuration of controls is the same as that of the DD-4, save for the lack of VSC. With no VSC, the DD-3 is a certainly a hotter proposition and more of a straight-ahead playing experience. There's enough tonal depth on tap in spite of the thinner body design, with Zakk Wylde-style squeals and pentatonic runs sounding most authentic. Lowering the gain to classic rock levels gives a nicely idiosyncratic rhythm tone that's focused and direct, with a brash treble: imagine AC/DC if Angus used an overdrive pedal to boost his tone. The neck pickup is also a useful tool, and is hot enough at lower levels of amp drive to add a certain amount of bite to lilting Peter Green lines. It can also deal with additional gain for Gary Moore-style runs without becoming indistinct. Don't let the goldtop fool you as this guitar can truly rock, and there are more modern finishes to go for if you prefer. It's fair to assume that the DD-3 will appeal to rock and metal players. It's lightweight and has a lovely neck that's perfect for shredding, and if the old school gold hue doesn't fit comfortably with the metal genre, the open-pore black finish is perfect. Blade has always made great guitars and we're confident this revamped Durango, with its modern feel, great choice of tones and high build quality, will appeal to a wide selection of players.